A low-calorie pulled pork recipe? Believe it. Slow-cooked pork shoulder needs no effort, while you can tailor the fixings to your liking. Mix all the marinade ingredients together in a small bowl. Place the pork in a non-reactive bowl, add the marinade and turn to coat. Cover with cling film and leave to marinate in the fridge for at least a couple of hours, ideally overnight. When ready to cook, preheat the oven to 160C/140C Fan/Gas 3. Place the pork and marinade in a roasting dish and cover tightly with foil, making sure it’s well sealed. Cook on a low oven shelf for 4 hours. Meanwhile, for the pickled pink onions, put the onions in a small bowl, pour over 350ml/12fl oz boiling water and leave to stand for 10 minutes. Drain and return the onions to the bowl. Add the salt, oregano, cumin seeds, cider vinegar and lime juice. Mix well, then cover with cling film and place in the fridge for 2 hours. The onions will pickle and turn pink. When the pork is cooked, remove from the oven and set aside, still covered, to rest for 20 minutes while you make the tacos. Turn the oven up to 200C/180C Fan/Gas 6. Take two muffin trays and turn them upside down. Lay a tortilla over one of the mounds and poke them down the sides to create a bowl shape. Spray with 4–6 sprays of oil. Repeat with the remaining tortillas. Bake for 7–8 minutes or until the tortilla cases are golden-brown. Remove the foil from the pork and shred the meat, using two forks. Mix the pork well with the marinade and pan juices. Place back in the oven for 15 minutes or until heated through. 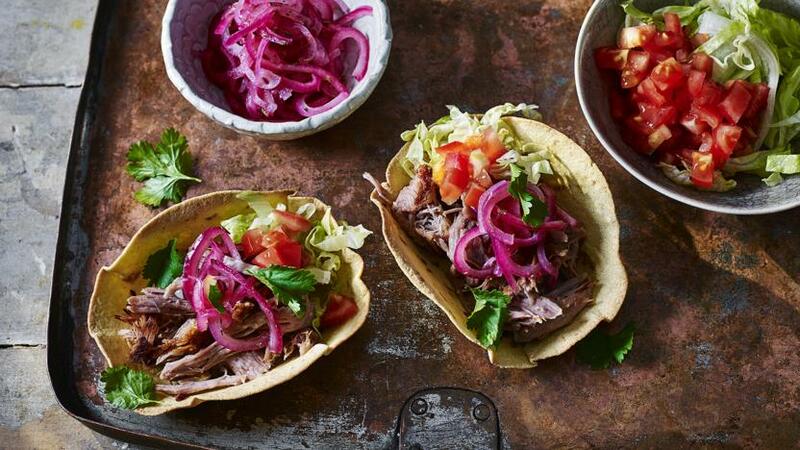 Place a tortilla bowl on each plate and fill with a pile of pulled pork. Arrange the shredded lettuce and tomatoes on the side. Top with the pickled pink onions and coriander and serve straight away.